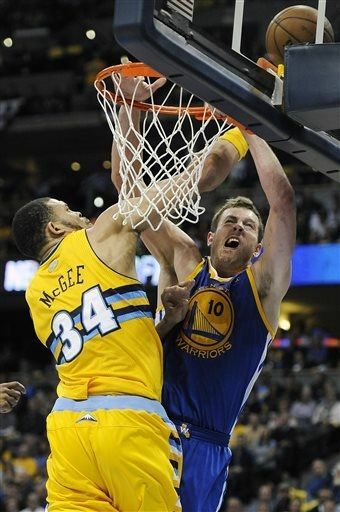 JaVale McGee erases a David Lee dunk (AP Photo/Chris Schneider). The Golden State Warriors (0-1) were defeated on April 20 by the Denver Nuggets (1-0) in the most exciting playoff game of the day. The Warriors World staff breaks down the loss in this most recent installment of 3-on-3. 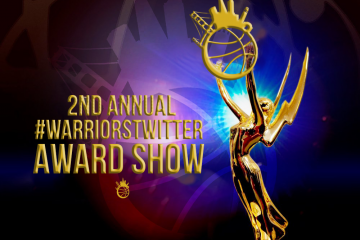 1. Who was the best Warrior in Game 1 versus the Nuggets? Jack Winter: Andrew Bogut. David Lee produced consistently after the first several minutes and before leaving with an injury, Steph Curry had some huge second half baskets, and Jarrett Jack filled the box score despite poor shooting numbers. But Bogut was Golden State’s most effective player today, showing off the rare quickness and anticipation for a player his size that makes him such an impactful defender. He was a terror at the rim all day, and constantly kept balls alive off the glass. Bogut never got it going offensively, but his influence on the other end was key in limiting Denver’s opportunities in the paint. The Warriors won’t always be so offensively inept; if Bogut can anchor the defense like he did today, this series should be a long one. Jordan Ramirez: The best Warriors player was Klay Thompson, although you can make a case for Andrew Bogut here as well. Klay kept the Warriors in the game throughout the first half, becoming the go-to-guy we all believed Steph to be. Now, the Nuggets were trapping Steph and forcing him into double teams near the three-point line, allowing Klay to matchup with Ty Lawson for the majority of the game. This obviously was an advantage for Klay who totaled 22 points on 10-for-19 shooting (2-for-5 3PT) and only two turnovers. The big question heading into this game — and the series — was who besides Steph will score? Klay answered the bell when Steph, David Lee and Harrison Barnes went awol. Whether the Nuggets make any adjustments on Klay will be an interesting development and something to keep an eye on. Do they leave Steph more in the following games? How does Faried coming back (fully healthy or not) affect the Warriors inside? Is Jarrett Jack God Mode now a thing of the past? J.M. Poulard: Andrew Bogut was the best Warrior in Game 1 on the strength of his defensive brilliance. The former Buck changed field goal attempts at the rim, swatted shots and beautifully cleaned up the glass. Bogut was simply a terrorizing force for the Dubs. 2. Fact or Fiction: Stephen Curry will struggle throughout the series against the Nuggets. Jack Winter: Fiction. Curry missed many shots he usually makes today, shooting just 7-of-20 from the field. But the box score lies a bit, because once he hit his first shot the floodgates (somewhat) opened; Curry made seven of his last 11 attempts after missing his first nine. It’s a make or miss league, and even the best shooters sometimes struggle. But they correct themselves in time just as Curry did in the second half today; there’s no reason to expect he won’t build on that today’s late success going forward. Credit George Karl and his staff, though. 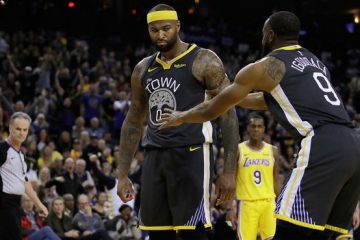 Golden State was thrown early when the Nuggets aggressively double-teamed Curry on high pick-and-rolls, and again late as Wilson Chandler and Corey Brewer face-guarded him beyond the three-point line. 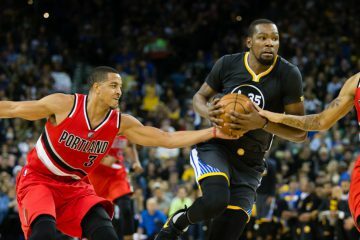 Mark Jackson will surely adjust and his player will too; this is chess match to keep an eye on as the series moves forward. Jordan Ramirez: Yes, but that doesn’t mean he won’t be effective. This is Steph’s toughest challenge to date as he’s the focal point to the Nuggets every move on the defensive end. They doubled and trapped him all during Game 1 and one of his all-time worst halves ever. You would like to see Steph be more efficient as well. 19 points is pedestrian for such a gifted scorer, but 7-for-20 is just slightly concerning. His first half was actually understandable: his first ever playoff minutes, being the defense’s main focus and in such a hostile, high-altitude environment like Denver. I expect Steph to settle down and have a much more effective game — especially in the first half — in Game 2. Also, I expect the coaching staff to find additional creative ways to get him the ball. As tired a narrative it may be, Steph still doesn’t run the offense as much as I’d like him too. When not engaged by two defenders there’s no reason why Steph shouldn’t be handling the ball and leading the offense. Jarrett Jack might disagree, but too bad. J.M. Poulard: Fiction. Curry missed his first nine field goal attempts and was pressing a little early on. He took a few semi-difficult floaters and missed a few open jumpers. But once he collected himself and got a shot to drop, he was back. Steph made 6-of-10 shots in the second half and helped keep the offense crisp. Curry created some looks for himself and drilled them. It stands to reason that he should be able to do as the series progresses, but Mark Jackson will have to make a few subtle adjustments to take advantage of the Nuggets’ double team as well as continuously spring his leading scorer loose. 3. Biggest take away from the Warriors’ Game 1 defeat against Nuggets? Jack Winter: Bogut’s activity. Golden State lost this game but there were a few positive takeaways that suggest future success, Klay Thompson’s early scoring binge among them. But Bogut’s play is the most encouraging on-court development for Golden State in quite some time. Today’s Bogut was the one we imagined suiting up for the Warriors all season long, but nagging injuries robbed him of health and the team a legitimate paint presence on both ends of the floor. If he can build on this performance the rest of the way, Bogut has the size, knack and skill to swing this series and any others that follow. It was just one game, after all, on the road, too; there’s still many games to be played. Jordan Ramirez: The Warriors are ready for the moment. The Warriors are the sixth seed, but let’s not forget they’re also the sixth youngest team (27.3) in the NBA. Let’s not forget that four of the five starters for the Warriors were playing their first playoff minutes ever in Game 1. This very easily could’ve been a double-digit loss when the Nuggets extended their lead in the 3Q. Instead, the Warriors showed great resilience and poise for a team popping their playoff cherries on Saturday. This team wasn’t swayed by the playoff atmosphere one way or the other. They are playing above their age, but whether this continues throughout the series is another question. For now, we should be impressed. 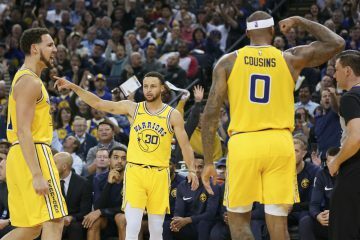 Game 2 will be tougher to steal now that the Nuggets have all traces of momentum, but I can’t put anything past this quirky but mentally strong Warriors squad. J.M. Poulard: Golden State actually controlled the pace in Denver, which is no small feat. The Dubs had a plethora of miscues but still held the Nuggets to 97 points. It’s not that the defense was amazing but rather that the half-court execution produced some quality looks and took away Denver’s transition game. The Nuggets only scored seven fast break points. Also, the Warriors collected 55 rebounds to the Nuggets 45. That was a huge aspect in controlling the pace and keeping Denver from running wild.